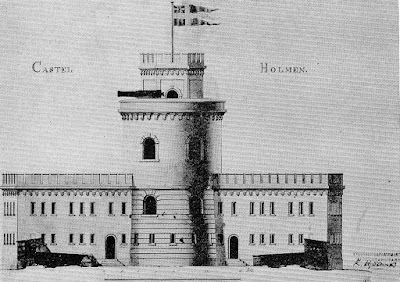 Kastellholmen's castle. The salute cannons are covered for the winter. Kastellholmen is a small but prominent island in the middle of Stockholm’s harbor. Historically, it was of ceremonial importance but today the island is relatively forgotten and underutilized, perhaps for the better since the small island would easily lose its character if it were inundated with visitors. Kastellholmen is reached by a small bridge from the island of Skeppsholmen (map 1) which is in turn reached by a bridge from central Stockholm; the harbor ferry which connects mainland Slussen with the islands of Skeppsholmen and Djurgården (map 2) doesn’t stop at Kastellholmen even though the ferry circles around it. Kastellholmen seems to be just far enough off the beaten path to escape the hordes of Stockholmers and tourists which sometimes inundate Skeppsholmen and Djurgården. Historically, the island has also been just far enough off the beaten path to escape a more dense urban exploitation. 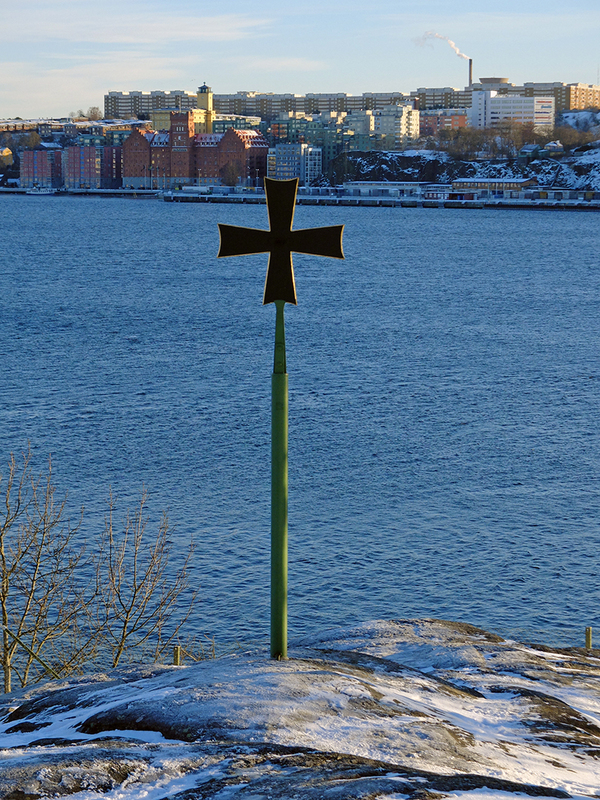 The small, rocky outcrop doesn’t really turn up in the historical record until the 1600’s when Sweden’s naval base and naval shipyards moved to Skeppsholmen in downtown Stockholm. At that point, a small “castle” was built on the crown of Kastellholmen. The “castle” was in reality a very simple, small octagonal wooden building with a prominent flagpole where the Swedish naval flag has flown since 1665. Because of its location at the entry to Stockholm’s harbor at Skeppsbron, this particular flag has always been a symbol to incoming ships that the capitol city is still under Swedish rule and that it has not been captured by foreign forces. The castle basement was historically used to store gunpowder for the islands salute cannons. Every time a naval or cargo ship left or entered the harbor, the ship fired a salute toward Kastellholmen. Kastellholmen’s salute cannons fired a salute in return, and ships carrying important individuals such as the king or the admiral of the fleet were given a full salute with all six cannons. Additionally, every evening an “all is well” shot was fired. Inhabitants of Stockholm must have been pretty well used to the thundering roar of cannons if every passing ship in the bustling harbor warranted a salute! As a side note, I wonder if the saying that a city is booming came about during this time when every ship fired a salute upon entering or leaving the harbor. Only cities which attracted a lot of trade and commerce would have had a literally booming harbor. By the mid 1700’s, the castle was nearly in ruins, and parliament voted to rebuild the building in stone in 1746. Except for the stone construction material, the new building was basically a copy of the old one—a small octagon with a prominent flagpole. 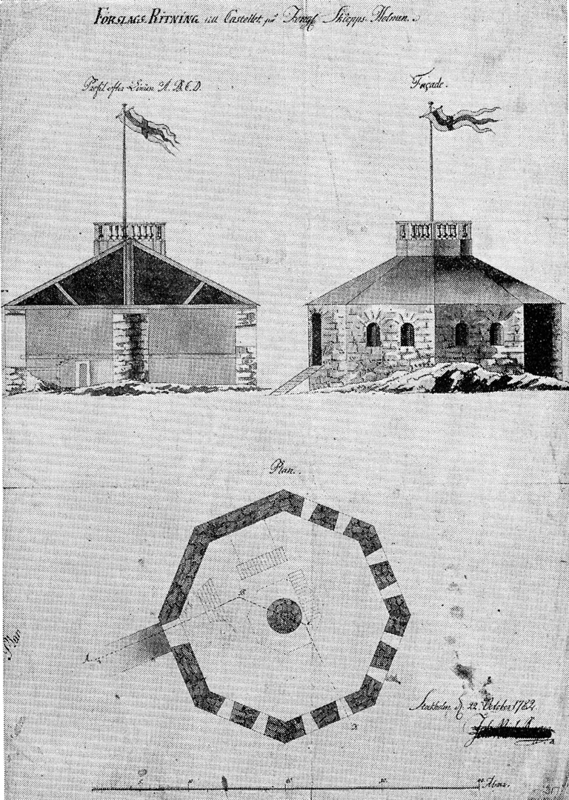 The salute battery was also augmented for a total of 16 cannons. The rebuilt stone “castle” blew up in 1845; because of its symbolic importance, authorities originally suspected a terrorist attack but it soon became clear that the navy had been using the gunpowder storage room for experimentation and that one of the experiments had gone awry. 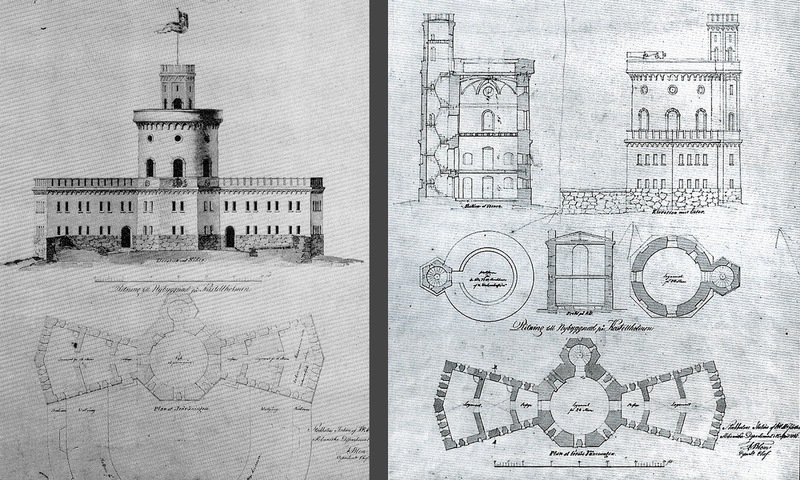 Eventually, the king authorized the building of a new castle, and Colonel Meijer drew up plans in 1846. This time, the castle was to be a bit more castle-like. While still petite, the new castle would be considerably larger then the first two—a more prominent tower would hoist the naval flag even higher above the water and two-story wings would serve as quarters for navy sailors. By the mid 1800’s, National Romanticism began to sweep the country and even the military began building in a “traditional” defense style with crenellation details and slit windows despite the fact that Sweden had been too poor and isolated in the middle ages to build this type of defense installation. The new castle was no exception, and Meijer’s drawings show a plastered building with a heavily rusticated tower base, slit windows, and several layers of crenellation that remind me of cake icing. Meijer’s compromise with the modern reality of the building was to make the slit windows wider than they would be if they were actually used as shooting blinds so that the dorm rooms wouldn’t be overly dark. Eventually, due to politics, naval officer and architect Fredrik Blom was asked to refine the building. Blom didn’t change the building greatly, but his tower meets the building’s wings more gracefully due to an octagonal base, and Blom chose to use irregular stonework as the rustic base instead of plaster. It is Blom’s Castle that crowns the island today (map 3). Although the Castle was never really meant for defense, it was fitted out with anti-aircraft guns at the beginning of World War II. These guns never had cause to fire. Today the Castle is used as the Naval Officer’s Club. The Castle tower from the south and from the north. While the castle is the most prominent and symbolic building on the island, there are several other buildings of interest. Going along with the theme of the island being off the beaten path, the naval hospital (map 4) was moved to Kastellholmen in 1736 because the island was believed to be far enough “off” to prevent the spread of disease. Compared to the navy’s former “sick cabins,” the new hospital was a relatively lavish building with a wooden second floor built upon a solid brick base. Each floor contained two hospital halls with 25 beds each as well as doctor’s offices, a kitchen, and storage rooms. In the mid 1800’s the building ceased to be used as a hospital and it was renovated into dwellings for workers, giving the building its current name of Hantverksbostället or “craftsmen’s dwelling.” The building is still used as apartments, and I would just love to live here—to have a small country garden in the middle of the city, and what a view! Other enviable residences on the island include the Flaggkonstapelsbostället (map 5) which was built in the 1770’s to house the Flag Captain in charge of hoisting the naval flag every day. 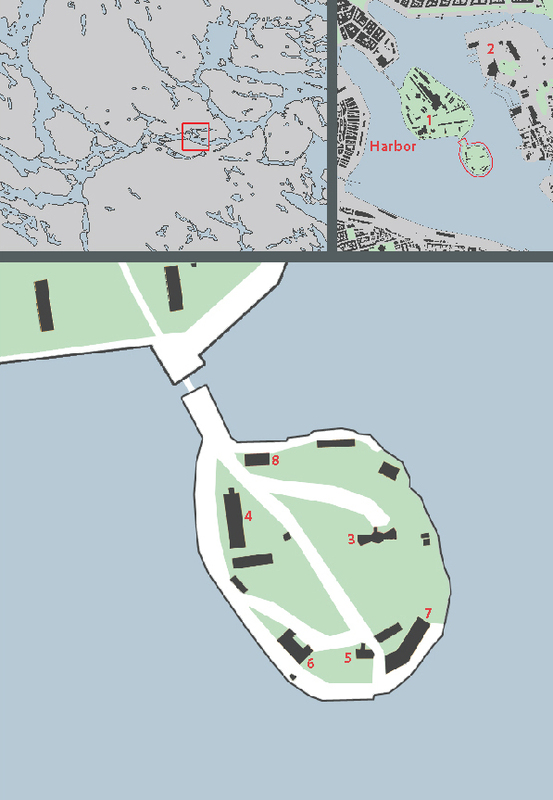 The Underofficersbostället (map 6) was originally built on another island, but it was disassembled and moved to Kastelholmen in the 1850’s. It was used as housing for naval officers; today both of these buildings house private individuals. New technologies often require new buildings, and in the 1850’s the navy needed a place to store coal for its new steam-powered ships. Blom drew up a simple but elegant coal shed (map 7) with brick columns and wood infill. The shed is right at the water’s edge, and the backside is embedded in the island’s living rock. Although new military buildings continued to be built on both Skeppsholmen and Kastellholmen throughout the 1800’s, the public gained access to the islands in the mid 1800’s and the islands soon became popular destinations for weekend outings. The use of Kastellholmen for public recreation is symbolized by the Royal Ice Skating Club’s Pavilion (Kungliga Skridskopaviliongen, map 8) which was built in the 1880’s by architect Adolf Emil Melander. The brick pavilion would be at home among any other Victorian-era development, but the tower and crenellation details are meant to meld with the Castle at the top of the hill. These days, there’s not much ice in Stockholm’s harbor and the pavilion is rented out for parties. 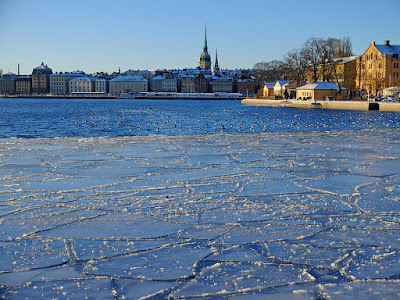 Stockholm's harbor's ice after a couple of exceptionally cold weeks: not great for ice skating these days! Today, Kastellholmen is a small but idyllic park-like setting with a waterside promenade that nearly circles the island, a hill with bird’s-eye views out over the water, and mature hardwoods providing verdure. While the hill is natural, the island’s park-like atmosphere is completely man-made. The waterside walkways are mostly on filled land, and the island was originally barren and wind-swept. Several trees were planted near the bridge in 1796 but most of them were planted in the 1860’s. The trees have matured into stately hardwoods that soften the island’s impression. Due to the trees, the Castle is no longer as prominent over Stockholm’s harbor as it once was, but it still captures the curiosity and imagination of many who circle around it on the harbor ferry. Like Skeppsholmen, Haga, and Gärdet, the island is now part of Stockholm's National City Park. 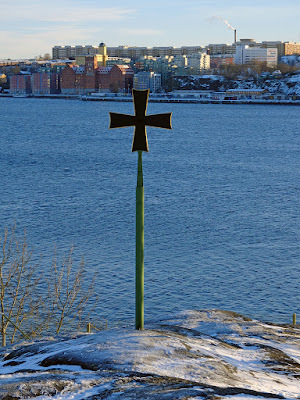 View from the top of Kastellholmen's hill. 1) Nils G. Wollin, Skeppsholmen under 300 år: Skeppsholmens, Kastellholmens och Galärvarvets bebyggelsehistoria (1971). 2) Bo Lundström, Officeren som arkitekt och konstnär i det svenska 1800-talet (1999).